For most meals, I like a bit of unpredictability. My lunches are usually off the cuff with whatever I have in the house while my dinners are a bit more planned, but are still usually a trial run or test of a recipe I’m working on. Breakfast, however, is my constant. 95% of the time, it’s oatmeal, eggs, or granola + yogurt with the other 5% reserved for waffles, pancakes, and other rich breakfast foods. Breakfast is very predictable. I do, however, like to mix things up a bit. My oatmeal toppings vary depending on what’s in season and eggs could take the form of an omelette or egg skillet. My granola is rarely made from just oats and more likely to contain an mix of grains. Or, it may be made entirely from something else, like this quinoa granola. I have a different quinoa granola on the blog made from whole quinoa but this particular recipe utilizes quinoa flakes. I’ve used my favorite base granola recipe that contains minimal ingredients but provides enough glue to hold everything together. This quinoa granola isn’t overly powerful in flavor but instead, is a nice boost to a morning parfait or granola bowl. Instead of doing pairings, I thought I’d give a few seasonal or meal ideas for using this quinoa granola. I’ve stopped looking at granola as one-off topping for yogurt and looked to it a bit more for savory dishes as well. Spring: Both A Couple Cooks and Beard and Bonnet have a rendition of my spring variation, roasted strawberry yogurt parfaits from The Easy Vegetarian Cookbook. 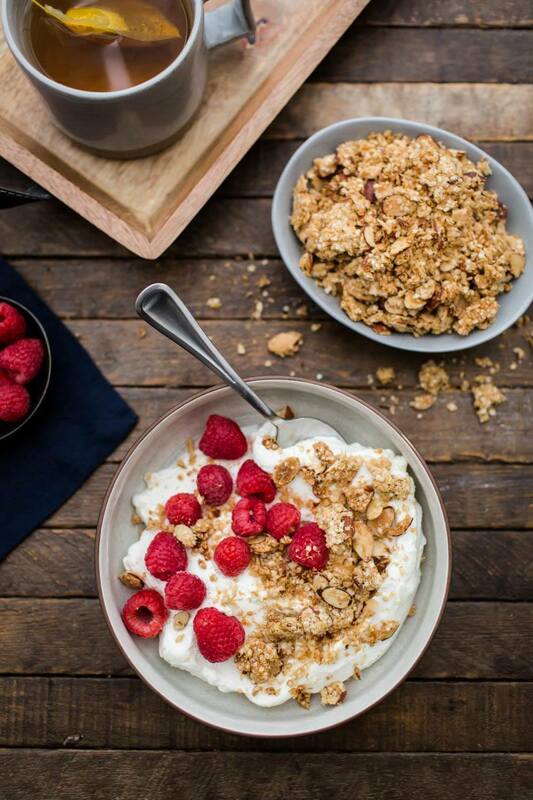 Roasted berries are a great companion for this granola. Summer: During the summer I’m looking for simple desserts. Try grilling peaches and topping with a scoop of vanilla ice cream and a sprinkle of granola. Fall: Stew some pears with a bit of butter and maple syrup then top yogurt (or ice cream) with the pears and this quinoa granola. Winter: Yogurt with Lemon Curd and Granola- one of my breakfast during the winter and a great way to use up citrus. I can’t wait for my lemon tree to produce lemons just to make this curd! For these savory dishes, try adding some herbs or spices to the granola mix after cooking. I like to toss granola with a rosemary and thyme or sometimes bake it tossed with a bit of curry powder. Spring: Use almost as you would bread crumbs. Toss granola with a bit of garlic powder and smoked paprika before baking then top a dish like this asparagus with eggs. Summer: Swap out the croutons on your summer salad for a some granola. Gives the crunch you’re looking for with a bit of extra nutrition. Fall: Butternut Squash Soup is usually a weekly staple. Try tossing the granola with fresh minced rosemary and sprinkling on top of the soup before serving. Winter: Pan fry Brussel Sprouts and toss with a drizzle of olive oil, a bit of crumbly cheese (maybe even some blue cheese), and some granola for crunch. Combine quinoa flakes, almond slices and salt, then stir together oil and syrup. Pour over the flakes and continue to stir until everything is well coated. Place mixture on the baking tray and press down with the spoon or your hand, making sure the mixture is compact and tight together. Bake for 30 to 40 minutes, checking once or twice to make sure the granola isn’t browning too quickly (I’ve found different ovens handle this lower temperature a bit differently). After thirty minutes, check every 5 minutes or so until the granola is a nice golden color and there are no wet spots. Remove from oven and let cool completely. 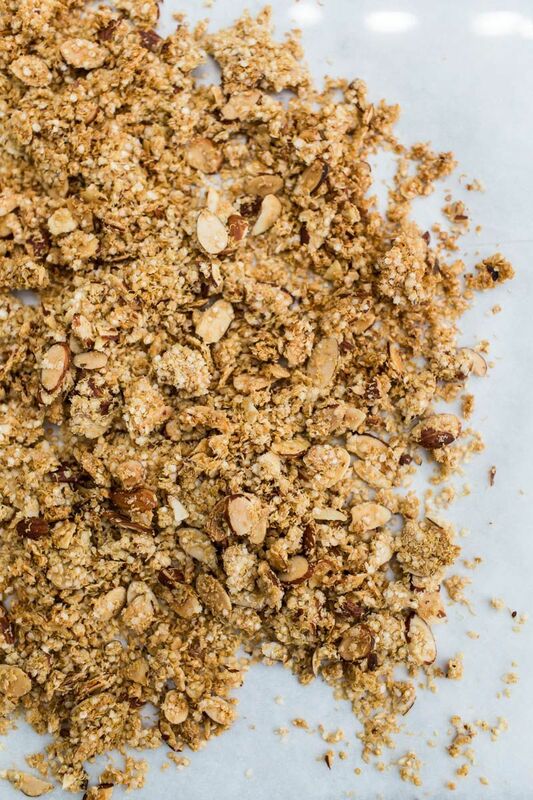 Once cool, break the granola into pieces (if you don’t wait, the granola won’t be as clumpy). Store in an airtight container for up to a week. + Swap in your favorite nuts or add in some seeds. I’ll sometimes toss swap out some of the almonds for sunflower seeds. +Recipe is pretty much from my favorite granola recipe. I absolutely love quinoa flakes. So versatile. I’m going to make a batch of your granola this week to crumble over the last of our mango harvest. 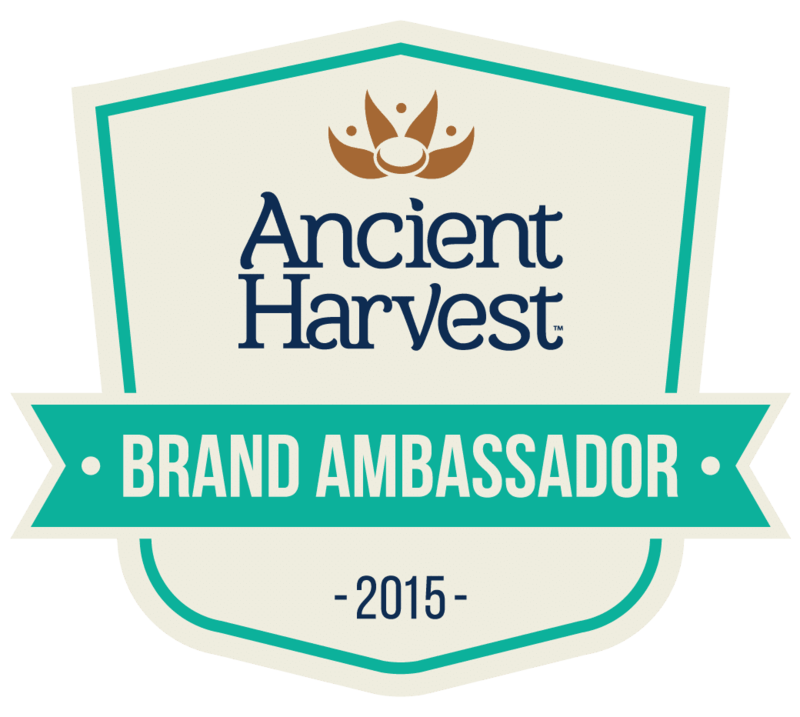 Also- I highly recommend the Ancient Harvest crispy cookie recipe on the side of the box! I am salivating at my desk. 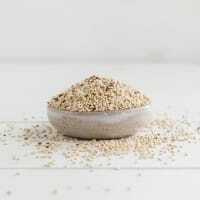 I love having oats for breakfast but will definitely be trying this out! This looks amazing! I gonna have to make this when i get home from my trip! Mhmm this looks amazing! I never thought of incorporating quinoa into granola, but it’s a great way to incorporate some extra protein into your diet! This granola looks incredible. Your granola pairing ideas are so creative! I never would have thought to add granola to savory food, but this is genius. I’m loving the idea of putting this on stewed pears with yogurt. Um, YUM! I never had quinoa flakes. definitely have to check them out and give this granola a go. 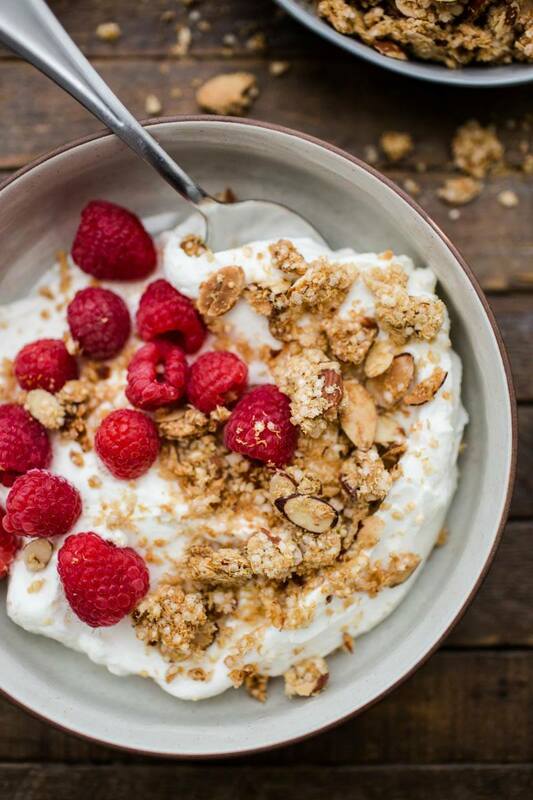 granola and yogurt is my go to breakfast so I am always up for new ones. 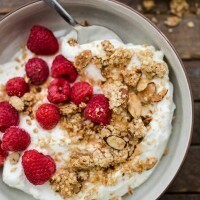 This looks like perfection, I love granola! This is so brilliant and simple I love it! Cannot wait to give it a try <3 yay quinoa! I haven’t heard of quinoa granola either. I’ll have to add this to my grocery list. Thanks! You’ve convinced me to get some quinoa flakes. Love this! I love quinoa. I haven’t heard of quinoa flakes or would never have thought of making granola with it. And savory dishes – amazing idea. Keep the recipes coming. I love them. It surely works wonderfully for toppings! A great and healthy way to topped off breakfast to ensure you’re getting the extra nourishment. Thumbs up for this! I just started a 3 month Unprocessed Whole Foods trial and this breakfast looks like an absolute win! 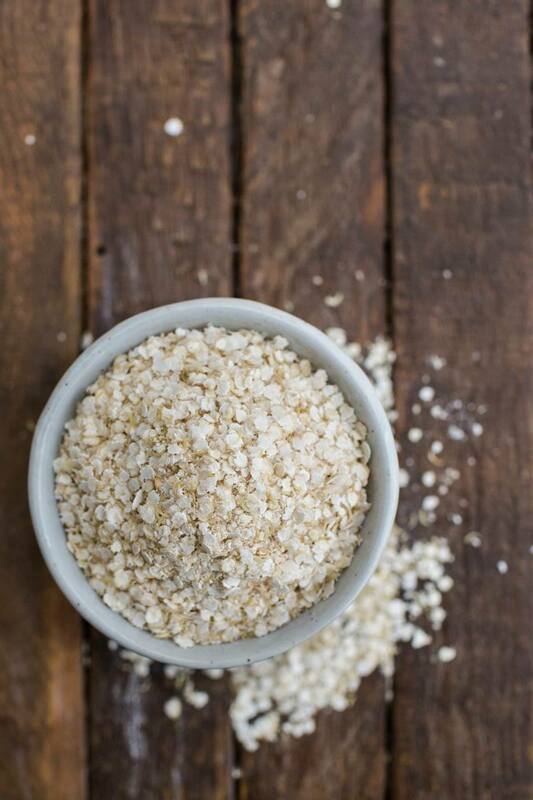 Loving the idea of quinoa flakes instead of oats. Would Puffed Brown Rice work as well?? I’m honestly not sure since I imagine that puffed rice might become a bit soggy with the liquids (but I’ve never tried, so I can’t really guide!) If you try it, please let me know how it works! Thank you so much for this recipe! Its amazing! I had a bag of quinoa flakes in the pantry and was out of ideas as to what to do with it, until I found your blog post. I doubled the recipe and added a mixture of dried cherries, hemp seeds, sunflower seeds, walnuts, and sliced almonds. I baked the granola for 32 minutes. I didn’t get any granola clumps but its still incredibly delicious!